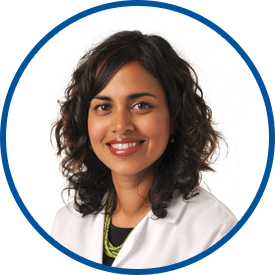 Dr. Sharma is double board certified in internal medicine and obesity medicine. The primary focus of her practice is on obesity, women’s health and preventive medicine. She was awarded her medical degree from The University of Medicine and Dentistry of New Jersey followed by her residency training at the Georgetown University Medical Center in Washington, D.C. In January 2004, Dr. Sharma established The Comprehensive Weight Control Program at Westmed, now called “Healthy Measures”. This program uses a multidisciplinary approach (diet, exercise counseling, behavior modification and pharmacotherapy) to treat men, women and teens whose health and wellbeing are compromised by their weight. Additionally, Dr. Sharma maintains a competency in providing pre- peri- and post-op care of bariatric surgical patients. Dr. Sharma is affiliated with both Greenwich Hospital and White Plains Hospital. She is a member of the Obesity Society and a Diplomate of the American Board of Obesity Medicine. Prior to joining Westmed Medical Group in 2003, she practiced in northern Westchester. This was my first time meeting Dr. Nitya Sharma and I was not disappointed. She was very caring and I am confident that she will help me improve my health. I think Dr. Sharma is wonderful! I have been using Dr. Sharma for some time and have confidence in her. She is supportive when things are going as planned and always has a word or two of encouragement when they aren't. I find her a good mix of giving strong direction and exceptions and understanding. Dr. Sharma should be commended for her professionalism, expertise and friendliness. Dr. Sharma is a wonderful healthcare provider. I never feel rushed and she has encouraged me through the years to stay active and eat right. she doesn't judge. I never dread my physical. I see it as an opportunity to improve myself. Dr Sharma has been my primary physician for years. she is knowledgeable, patient, kind and professional. GOOD EXPERIENCE - THOUGHTFUL, CARING KNOWLEDGEABLE AND HELPFUL. *Dr. N. Sharma is one of the most knowledgeable MD"s I have met. I have been an RN for 42 years! I've been recommended by friends and I've recommended her to relatives. *Sharma is an exceptional *dr. Possibly the best I've had @ WESTMED. Dr. Sharma is a great physician. I never have any hesitation to discuss any medical issue I may have. Very patient and meticulous.